Tall Claims of Cooking Oil!! 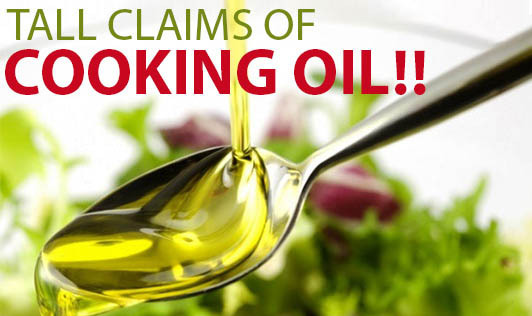 How many times have you picked up a cooking oil because you've been told that it does not contain cholesterol? Or how often do you buy a particular brand or type of oil because it is supposedly 'good for your heart'? The above health claims made by the companies are not false but they are not exclusive to that oil either. In other words, all vegetables oils are rich in essential fatty acids (EFA) so it's not an exclusive property of Sundrop. Similarly, all vegetable oils are cholesterol free and it's not exclusive to Fortune. Finally, all vegetable oils are free of trans fats and therefore not exclusive to Saffola. So do not get brain-washed into buying an oil thinking that your heart is going to be ticking forever because the oil that you've bought, and will use in your cooking, 'does not contain cholesterol' or is 'free of trans fats' or is 'rich in EFA'. Your heart beats because you take care of your overall health and not because of the type of oil you use. Have you seen these advertisements? A lady and boy jumping up and down, with poories and vadas flying around them. The advertisement tag line is ‘the healthy oil for healthy people' and the oil is said to make your food ‘light' or ‘superlight'! While you're trying to guess the name of the oil, please remember that no oil can make your food ‘light'. Fried foods can make you feel heavy and can also contribute to weight gain. The lightness in your body comes only when you eat less and exercise more, not thru any of the oils. A wife cooks food in an oil that gives ‘extra' health to her children and husband. This ‘extra' health makes her son perform well in his studies, her daughter win trophies in sports and her husband do well in his office! If an oil could improve everyone's performance, we would have a country full of people who excel in studies, sports and work. But reality is something else. A young couple where the wife is active but the husband is tired. So the wife brings an oil which will keep the husband ‘young'. There's no chance that fatigue can be driven away by eating foods prepared with a particular oil. Fatigue can go away only with a healthy lifestyle and adequate rest. By now, you might have understood what we are getting at. Basically, each oil has its own unique properties. Every vegetable oil has the same number of calories for a given quantity and can make you gain weight and girth if you use in excess. Bottom line is whatever oil you use, do so in very small quantities. Also try to use a variety of oils so that you get the benefit of different types of fats.